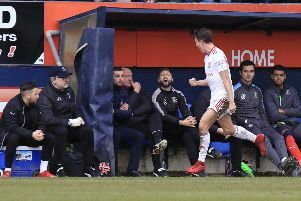 Luton boss Nathan Jones is taking careful consideration not to rush midfielder Luke Berry back into action before he is fully ready. The 26-year-old was seen warming up at Rochdale recently, while Jones had hinted that he could play a part in Tuesday night’s Checkatrade Trophy group stage clash at Peterborough United. However, he wasn’t involved as Luton were beaten 2-1 at the ABAX Stadium, as speaking afterwards, Jones said: “It’s just a bit early for him. “We keep saying we can’t rush him and he’s come back from a few little things, so when he trains hard, he sometimes has a little bit of inflammation. However, full back Dan Potts is now back in full training and could be in contention to face Plymouth on Saturday after missing the last four matches. Jones added: “Potty’s been doing really well and if we needed to have won the game, we might have played him, but we didn’t.